We try to keep a good mix here on WYG of concrete, creative, practical, and outside-the-box thinking about grief. We have a series on some very concrete information on grief, delving into the topic of grief models. We started with the theory that pop-culture loves and everyone knows – the five stages of grief. If you missed it, make sure you check out our post on the 5 Things You Should Know About the 5 Stages of Grief. Today may not be the most creative or exciting post, but it is important stuff. As we mentioned in that post, Kubler-Ross’s Five Stage model really put grief theory on the map by opening up the conversation about the dying process, death, and grief. Over the years other theories have emerged, many of which have transitioned from the concept of “stages” to the concept of “tasks”. I know I know, this all sounds very academic. I can feel some people’s eyes starting to glaze over and browser windows starting to close. Bear with me here – this is not just academic and may prove extremely relevant to you – promise! 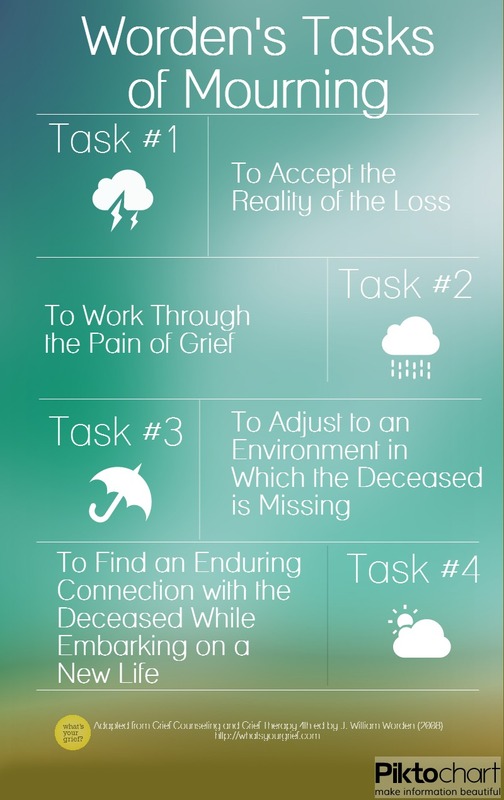 If you ever thought that your grief didn’t fit in the five stages, one of these task models may resonate with you. Today we are going to talk about William Worden, who describes four tasks of mourning in his book “Grief Counseling and Grief Therapy”. Don’t worry, we are just covering the down and dirty basics. You can always pick up Worden’s book if you want to dive further into his theory. Worden suggests that there are four tasks one must accomplish for “the process of mourning to be completed” and “equilibrium to be reestablished”. He makes clear these are in no particular order, though there is some natural order in that completion of some tasks presuppose completion of another task. He acknowledges that people may need to revisit certain tasks over time, that grief is not linear, and that it is difficult to determine a timeline for completing the grief tasks. What are the tasks, you are probably asking? Here we go . . .
Alright, so what is the deal with these tasks? How do you know if you have accomplished them or not? Well, the first task can be both simple and complex. There are basic ways one can accept the reality of a loss: going through the rituals of a funeral or memorial, beginning to speak about (and think about) the person in past tense, etc. On a more complex level, there is accepting the reality of the significance of the loss. For example, one may speak of someone in the past tense and accept their death but may downplay the significance of their relationship with that person, denying the impact the loss will have. On a basic level they may have accepted the reality of the loss, but on a deeper level, they will not have accomplished this task until they have fully accepted the depth of the relationship and correlating impact. Another common struggle with this task is around acceptance of the mechanism of the death. A death by suicide, overdose, or other stigmatized death may present challenges to accomplishing this task if family or friends are unable to acknowledge or accept the reality of how the person died. Ok, I know, I am starting to sound abstract and academic. Back on track to keep this simple and practical: task two is to work through the pain of grief. This may sound extremely broad because…well, it is! But that isn’t a bad thing. Rather than attempting to identify all the emotions of grief that one may experience and need to work through, Worden’s model acknowledges that each person and each loss will mean working through a range of different emotions. From sadness, fear, loneliness, despair, hopelessness, and anger to guilt, blame, shame, relief, and countless others, there are many emotions a griever contends with. What is important in this task is acknowledging, talking about, and understanding these complex emotions in order to work through them. The danger, of course, is denying one’s feelings and avoiding them. This tendency can be exacerbated by society’s discomfort with the feelings that accompany grief, so the griever may feel like they shouldn’t feel or acknowledge these difficult emotions. Task three is adjusting to the environment in which the deceased is missing. Worden acknowledges that this task can also mean very different things to people depending on the relationship of the person who has died, as well as the roles that are impacted by the loss. This readjustment happens over an extended period of time and can require internal adjustments, external adjustments, and spiritual adjustments. It may take a significant period of time just to realize the different roles their loved one performed or internal and spiritual adjustments that are required. This can be especially difficult for widows, who may need to learn a wide array of new skills and tasks, ranging from bill paying, parenting, and taking care of the home, to environmental changes, such as living alone, doing things alone, and redefining the self without the other person. This can also mean adjusting to a new spiritual environment, which may have been changed by the experience of death. This task requires developing the necessary skills to move confidently forward in the altered environment – internal, external, and spiritual. Finally, task four to find an enduring connection with the deceased while embarking on a new life. Worden re-thought and reworded this last task several times, but this is the wording in the most recent edition of his book. I have to say that this wording still isn’t working perfectly for me, because though I understand what he is trying to get at, the phrasing “new life” puts me off a bit. In his previous editions, this task was worded as “to emotionally relocate the deceased and move on with life”. As a person who hates the term “move on” I struggled with that one as well. Before that, it was “withdrawing emotional energy from the deceased and reinvesting it in a new relationship”, which Worden admits sounded mechanical and simplistic. Though Worden has worked through task four in several iterations, what is clear is that Worden is always refining and re-evaluating his own theory. As our understanding of grief grows, Worden has demonstrated a commitment to ensuring his tasks reflect his new and evolving understanding. Which is awesome. We love anyone who is willing to adapt and change their theory over time to better reflect changing understanding! The gist of task four is this – to find an appropriate, ongoing connection in our emotional lives with the person who has died while allowing us to continue living. Like the other tasks, this can mean varying things to various grievers. But it often means allowing for thoughts and memories, while beginning to meaningfully engage in things that bring pleasure, new things, or new relationships. For Worden, not accomplishing this task is to not live. It is the sense that life stopped when that person died and that one is not able to resume life in a meaningful way, with a different sense of connection to the person who has died. This last task can take a long time and be one of the most difficult to accomplish. So, there it is in a nutshell. For Worden, mourning is successfully completed when one has completed all four of these tasks. What is important for us to remember as regular grievers? Just as we said for Kubler-Ross’s model, it is important to remember that this is just a theory. There are many grief theories and none are proven to be absolute truth, but rather hypotheses with some evidence to support them, and some evidence to refute them. These are certainly helpful and relevant tasks, but if you do not feel like you have completed them that is not a reason to panic. It may mean you are still working through the process, it may mean that this is just not the model that best reflects your own experience. Grief is unique for all of us. If you are concerned that you are “stuck” on one of these tasks or need additional support with your grief, check out our post on seeking professional support. What do you think about Worden’s theory? Leave a comment to let us know! Glad to find a site that gives you practical, concrete information mixed in with creative and outside-the-box tools for coping? Make sure to subscribe to get our updates right to your inbox. We promise our next post won’t be nearly this dry! 35 responses on "Worden's Four Tasks of Mourning"
In April our church sponsored a half-day seminar on grief and loss. One segment was a thumbnail sketch of Worden — much like this blog. In the January following my wife died suddenly from a heart attack. My half-day with Worden was like a candle in a pitch-black room. It gave me a key to a locked door; it gave me a language when there was none; it allowed me find my way to further help. That was almost 10 years ago. There have been wise friends, professional help, hard work, and lots of tears along the way; but, I remain grateful for Worden’s wisdom in those first hours and days. Thank you for reminding me of that gift. achei е eu vou ѕer livro marcaçã᧐ e checando frequentemente! Thank you for sharing this model. I do have one comment about how widows may have it especially hard. “This can be especially difficult for widows, who may need to learn a wide array of new skills and tasks, ranging from bill paying, parenting, and taking care of the home…” Women already do all of those things. Rather, consider that the “surviving spouse” may feel overwhelmed by having to handle all household and family tasks that were previously shared with the deceased spouse. removed it, but may have to bring it back again. I was presented with by you motivation! My mother had dementia and as weird as it may sound it actually brought us closer than we ever were. Her emotional wall seemed to crumble and we were able to connect on a level that seemed impossible prior to this. Though inevitably the disease took my mom away from me, it also strengthened our bond and for that I will be forever grateful. So I guess what I’m trying to say is thank you and screw you Dementia. Anyway she passed away 3 months ago and life as I knew it went right with her. She was there one minute and gone the next. I knew her disease was terminal and that she was dying, but that never prepared me for when it would actually happen. I am dumbfounded and lost. You just can’t fathom that the first woman in your life; the one who brought you into this world and guided you for the rest, will never be a part of your life again. How does that even compute in my head? This made me realize how inconsequential every little thing I stress over actually is. It’s so hard to get shoved back into reality so prematurely. The world hasn’t stopped going but my entire life has been brought to a screeching halt. I just want everything to slow down because I can’t catch up. I am an emotional wreck. I cry at work, on the way home, watching TV, cleaning my house and lying in bed. I feel as though I’m walking on egg shells permanently. I know there is no rule book for grief and everyone grieves differently but I want to get to the point where the memories don’t make me cry anymore. I want to laugh and smile when I think of my mother. Please God let me get there! Interesting and potentially useful concepts but for key semantics that tend to make my head spin. The first one is “working through”. Many with whom I have worked think that there is some kind of destination, an arrival point after working through. When we switch the word, “through” to “with”, as in “working with”, the cyclic nature and levels of emotional, physical, and soulful distress are acknowledged and practiced through awareness of the process. This seems to be much more conducive to post-traumatic growth. The very use of the word “tasks” implies that at some point the destination has been reached. I know I am really being persnickety here, and appreciate all patience. What if we were to switch out “tasks” with “layers” of what we acknowledge is a cyclical process, and changes based on where we are in our human development, culture, familial, and spiritual practices. And finally, “being stuck”. This can be a highly effective state of grief when framed as “taking a time out” from grief. Sometimes the human soul simply needs to dwell. As long as our griever is aware of this dwelling place an effective therapist is able to facilitate, there’s that term again, post-traumatic growth. Working with and growing from taking “time out”. Mrs. Sutherland-Hoyt thank you for your response! It is very helpful. I am a MFT Associate, and would like to speak with you regarding being mentored by you. I would like to know what are the limitations of Worden’s Theory. Everyone grieves in their own way, in their own time. It’ s only been a couple of months….it’s still raw. We do “move through” and with faith and support, come out the other side able to live our lives productively, honoring our loved one with our memories. Peace and love to you. Grief, I am new to grief I have lost my wife about 1-1/2 years its been so hard on me we were together 37 wonderful years it,s still feel,s half on me is gone. Thank you for this post – I had not heard of this theory and it has more meaning to me at this moment – than the ‘stages’. I and my husband cared for my mom for 20 years, she lived with us for 11 and was in hospice care the last 2, with me at home as full time caregiver the past year. She died in April, a good pain-free death, of which I am more than grateful. But it seems that I am smack dab in the middle of task 3 and feeling somewhat paralyzed by it. She was a constant presence for such long time and I miss her so – she was a friend as well as my mom. And I am not sure how to BE with her gone. She was such a practical and un-sentimental person, I know she would just tell me to move on – but easier said than done. Kathleen Everett…..I think Task #3 and Task #4 can almost be combined. While we are adjusting to our environment w/o the deceased, we are trying to find a connection to the deceased so we can embark on a new life. I think that connection we seek can live in our memories. What was normal to us is no longer normal, so we must find/create a “new normal”. Maybe you and your husband can make a habit of regularly going to a restaurant that your Mom liked. Every time you are there you will remember her and this will now become “normal” for you to go there. Sometimes the simplest things we do can mean so much. Besides losing your mother, you have also lost your role as caregiver, so as you said, you don’t know who you are supposed to be now. Again, we have to create “new normals”. You still have a role as “wife”; you may have a role as “Mom”; or “Grammy”; or may need to return to a role as “co’worker”. But whatever we create, we will do it with purpose, with memories of our loved one, and with love. Sending prayers to take with you on your grief journey. No yet, but thanks Eleanor for the heads up. I’ll certainly look at those. Sorry, I meant to say I’m Not happily segued. And Worden’s theory. I’m brand new to your post. Looked up what is grief work as I wanted a real definition and came across your wonderfully informative site. So after 1.5 years post my husbands passing (married 50 years), I am surprised that I’m out just happily segued into my “new life” without him. I know, I know, it’s too fast, but I really need to get on with it. Anyway, I’ve read a couple of the theories so far, and I guess Worton’s resonates with me best so far, especially the phrase that he dropped finally, namely “emotionally relocate the deceased”. I feel that this is the most accurate description of what I am trying to do with Jack’s memory. I’ve moved to another province and am trying to do my grief work there without my supports, but also without all those constant reminders. It’s difficult, but would it be any less so in our home place? Who knows? But I do see that I am deep in the process of trying to relocate the deceased. Thank you for taking the time to write and share these posts. Glad to hear this model resonates with you! Did you have a chance to read any of our other grief theory posts? One theory that is very different than the “stage”, “task” model is the Dual Process Model. That a different take, but also has some value. And of course, continued bonds really resonates with a lot of grievers (although not all). This description helps tremendously in dealing with infidelity. Grieving the losses that accompany a betrayal has a number of societal issues that cause the hurt spouse to struggle. These tasks relate well to this process. I wish more therapists would understand. Dear Litsa- I came upon your website this evening as I was looking for Worden’s Four Tasks of grieving to share with a friend. I first learned of Worden’s Tasks eight years ago while in a Grief Group. In 2007 I lost my partner; we had loved one another for 21 years. Worden’s Task Four was like a message from Heaven for me. “Finding an enduring connection with the deceased” allowed me to realize I was not stuck as I refused to ever say Goodbye to my partner after his death. Worden’s words “enduring connection” surrounded me in a long missing feeling of warmth as I interpret enduring as eternal. Task Four told me I was okay in never saying Goodbye. Of course I understand and accept the earthly and absolute reality of my Loss, but for me, Worden’s Task Four offered a new and continuing path which I had not considered before. It offered me an invitation into a spiritual faith of my own design which had previously not been completely part of my beliefs. And now, all of these years later, Worden’s Task Four along with Henry Van Dyke’s “Parable of Immortality” remain two of the most comforting messages I’ve found. With your Website, you are providing such a wonderful comfort for people living with the pain of Loss. Thank you very much for all you put into it. I have found it very therapeutic and know I will visit it again. Yes, that is more like it! my friends. I ɑm confident they’ll Ьe benefited fгom tҺis site. What a treat to find this blog. I am scouting around for research and information about Worden’s work just now and happened across this site. After my youngest son suicided I remember undertaking the task of responding to all the cards and letters we received. I hand wrote each card and made my response like a mantra, repeating the same words in thanks to the person for their condolences following the death/suicide of my son. Then added individual bits in response to individual messages. It took six weeks to complete. It was such an awful task to be writing those words about the death of my son and yet I found it quite soothing. When it was done, I really felt as though I believed and accepted his death. It was a good thing to do. I am so sorry for the death of your son. I have to say, I have been one to view the tradition of thank you notes after a death to be a bit of a cruel tradition for the griever. This is great insight and helpful to know that it is something that ultimately was helpful for you. Thanks and hope you’ll keep visiting our site! I stumbled upon your blog while searching for articles related to Worden’s Four Tasks for a paper. I’m a graduate social work student, and I’m taking a Loss & Grief class this semester. Three months earlier, I turned 40; I used to think that this was “old” when I was younger. And I found more gray hair on my head. Two months after that, I quit a job because my physical health is declining. Two weeks before school started, I had to put my dog to sleep. I know this ended his suffering, but I missed my “second son.” The following week, my only human child moved away to college. I am proud of his accomplishments, but the house is too quiet. I had defined my life to my job, my son, and my dog. I had experienced other losses and deaths – some horrific – and this class has helped me tremendously on many levels. Not only have I been validated for how I’ve coped and can cope with changes, but I can also relate and educate future clients in their journey. I enjoyed your sensibility and humor in making these concepts easier to understand. Thank you for being a wonderful resource for others in their time of need! Thanks Korri- Glad you stumbled on our blog enjoyed the post. I am so sorry to hear about the various losses you have experienced recently- that is a lot in a short period of time. I am glad the course is helpful and wish you the best in your program- I am a social worker too! I feel a good word is integrating the grief into your life. You will never “move on” but you do integrate the grief and feel it alongside everything else, including joy which is not its opposite. I just checked out your Angel Zoe Kindness Project — what an incredible way to remember Zoe! Made my day . . . I don’t mind the term “move on” because that indicates we are not “stuck” in the time and space of the actual death, but I like to say we need to “reinvest” in life. As you say, we are capable of, once again, being joyful. Excellent post, Litsa ~ I really like that you are offering to your readers such accurate and easily understood explanations of these various grief theories ~ Thank you! I’ve added a link to your post on my Grief Healing Pinterest board (http://pinterest.com/griefhealing/grief-healing/), and it’s been re-pinned several times already! Thanks so much Marty. I think it is a shame there is still such a disconnect between grief theory and everyday grievers. Slowly but surely all of us out here blogging away will get the word out that there are lots of grief theories that grievers may find very helpful — far more than just the 5 Stages everyone knows so well. Thanks for sharing the post on pinterest! I can see the validity of Worden’s theory. I am definitely experiencing much of this. I see myself as currently working through task three, and, yes, it is difficult. Thank you so much for providing understanding. Thanks for sharing your experience, Louisa! I do think many of these grief theories allow us an interesting way to reflect on our own process. Glad to hear Worden’s tasks resonated with your experience.